An eviction is a legal process by which a landlord is able to regain possession of a rental unit. Each state has specific rules for evicting a tenant and if you fail to follow these rules correctly, you may be forced to start the eviction process all over again. Understanding the eviction process and knowing what to avoid can help ensure a quick and relatively hassle-free eviction. Here are three mistakes you should avoid when trying to evict a tenant. Harassing a tenant in the hopes that this intimidation will get the tenant to move-out. In some cases, this Notice is filed because a tenant is not paying their rent or is otherwise breaching their lease agreement. Other times, this Notice is given at no fault of the tenant. For example, a Notice to Quit can be presented if the rental property is being taken off the market for the foreseeable future. In this case, all tenants must leave the property or be evicted. The reason you are evicting the tenant will dictate how far in advance of filing for an eviction you must present the tenant with this Notice to Quit. Some reasons require a three-day advance notice, while others require more than a year. 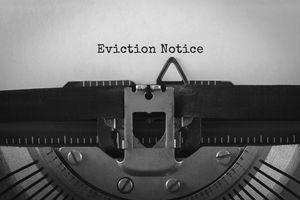 If you do not give this Notice to Quit, or do not give the Notice far enough in advance, you may have difficulty evicting the tenant and may be forced to start the eviction process over. Another common mistake landlords make is during the actual eviction proceedings. They do not have the proper evidence to support their claim for an eviction. For example, if you are trying to evict a tenant for nonpayment of rent, you must bring bank statements as well as any correspondence with the tenant that references this unpaid rent. If you are filing to evict a tenant for damages, you must bring pictures or any other proof that they have damaged the property. What happens if a tenant won't vacate the property?